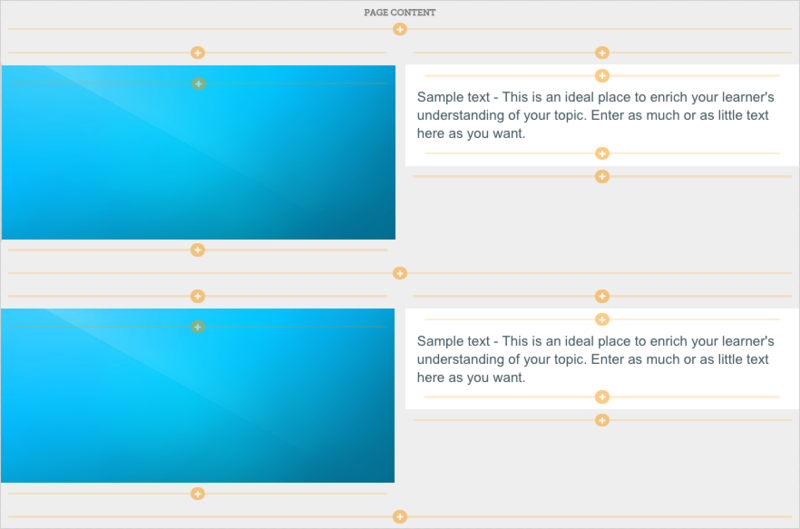 Elucidat’s Layout Designer allows you to create your own Page Types and interactions. 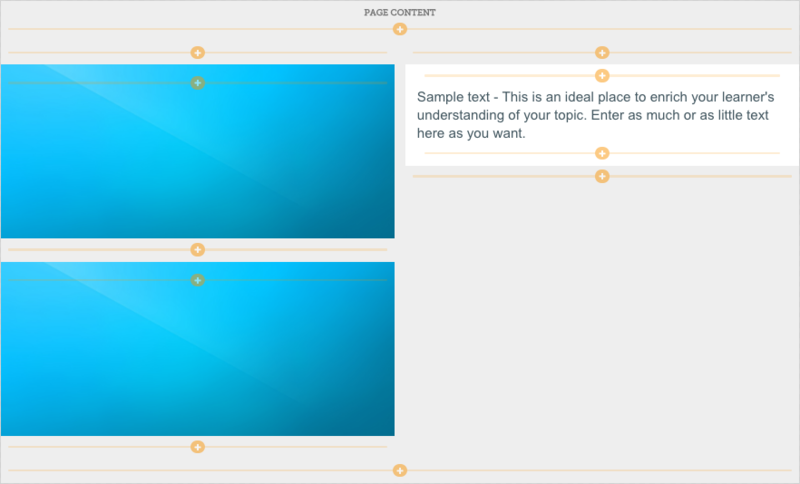 Layout Designer allows you to create Page Types by combining Parts. A Part is an element that your page is built up from, for instance I can have a page with a whole variety of different Parts, such as Text elements’, ‘Knowledge checks’, ‘Interactions’ and more. You can add as many, or as few Parts as you like to a page and in whatever order you like. Who can use Layout Designer? Layout Designer is available to any user that has the role of ‘Administrator’ or ‘Layout designer’ if you have an ‘Enterprise’ account, if Layout Designer is not activated in your account please get in touch. 💡 Please note: Layout Designer is a powerful role that allows users to make changes that are present throughout your account. If you are an account Administrator we recommend you provide this role only to trusted users. Firstly, let’s take a look at how to add a Part (click here to see what Parts are) to a page using Layout Designer. ....and dragging your Part to the ‘Add here’ button that you wish to move the Part to. 💡 Pro Tip! If you have added Parts to within a ‘Container’ you can copy the entire container and the Parts which you have added to it by clicking the duplicate button the entire container. ...please search for 'Parts Variations' for more information. So far we have mainly been looking at Page scope, Page scope is the content that is unique for each individual page. Project scope is global content that is available through out your whole course, for instance your footer, header and main menu. You can switch from Page to Project scope in Layout Designer by pressing either the Footer or the Header (highlighted above). Project scope has some unique Parts which will allow you to edit the presentation of your Headers, Footers and Menus, (see 'Project Parts') to learn more. Once you are happy with all of the edits you have made you will want to save your changes, if you don’t wish to save your content refresh your screen and when prompted press ‘Reload’. How would you like them saved? 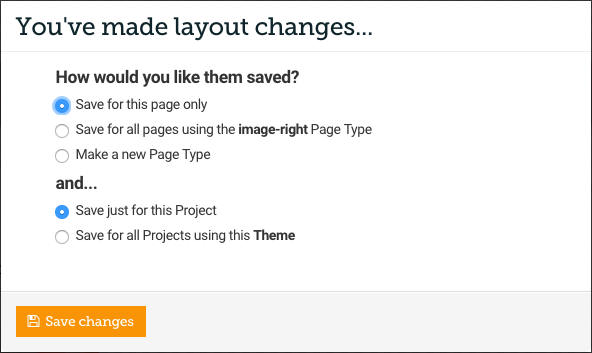 This option will mean that that the Layout will only be changed for the specific page in the Project you are editing. This option means that all pages using the same Page Type will be affected inherit changes you have made to the layout of the page. With this Page Type you can choose if this applies only to your current Project or if this is applied to your main theme by choosing a Save scope. This option creates an entirely new Page Type. 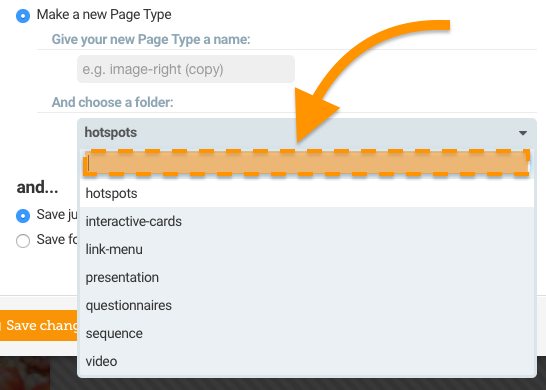 You can rename your Page Type by adding a name to the ‘Give your new Page Type a name’ field, then choosing a folder for your Page Type to be assigned to from the ‘And choose a folder’. Make sure you give your Page names and Folders sensible names as currently there is not a way to delete or edit this. This setting will mean that your change is only applied to your current Project, this is useful if you would like to make a one off tweak to your layout. This setting will mean that your change is applied all Projects in your account, please be careful when using this setting as this cannot currently be undone, if you have any questions about whether you should be using this feature, please get in touch. 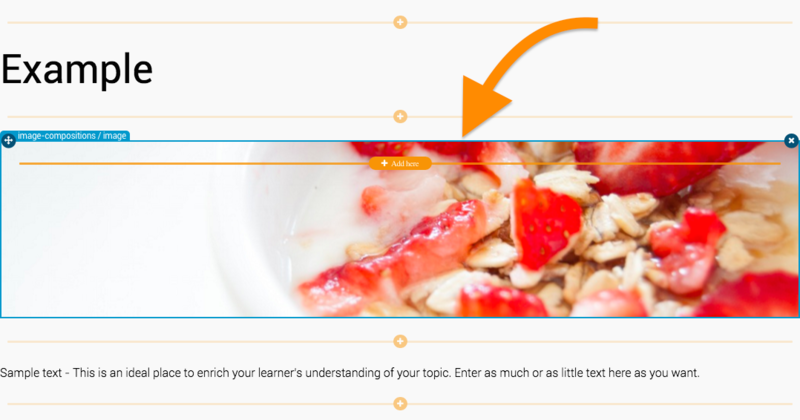 Now that you know your way around the Layout Designer feature it’s time to get building! Why not try one of these tutorials to test your skills.